The most recent arrivals to Tamriel's shores are the Redguards of Hammerfell. They quickly adapted to the harsh desert of their new homeland and made a former wasteland into a power to be reckoned with. Hammerfell only acquired its name with the coming of the Redguards. Before then, it was called Hegathe by the Aldmer, and Deathland by the Nedic people, roughly saying the same thing. 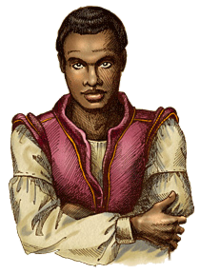 Hegathe, as a name, lives on as the name of the original Redguard capital, but into the First Era, the Nedic name began to be used by one and all to refer to the barren land north of Colovia, south of the Iliac Bay. Not that there was much reference to it historically. It was desolation, a wasteland where hot winds blew over burning rock, and the only feet that walked the sands belonged to monsters. The elves and later the Bretons did set up outposts in what are now Sentinel and Lainlyn in order to protect their fisherfolk and seafaring merchants from the Orcs who had taken over the interior of the land. Nor were these the only dangers of record. Wind spirits, fire spirits, goblins, trolls, and scorpions the size of horses regularly crept in from the desert, and were rebuffed at the frontier, sometimes at a terrible cost. In the year 420 of the First Era, a tribe of Dwemer arrived in the Deathlands from the east. They were of Rourken's people, rebels against the alliance of Dunmer and Dwemer in Morrowind. Settling far from the Bay, along the southern coast, they soon established an easy trading relationship with the elves to the south and Bretons to the north, and the Deathlands took the Dwemer name of Volenfel [sic], "City of the Hammer", after the Dwemer capital whose ruins now lie buried under the sands of the Alik'r near Gilane. The House Rourken's severing of ties with the Dwemer in Resdayn did not protect them from the results of the War of the First Council. Like the other Dwemer, the Rourken seem to have vanished suddenly from Hammerfell, leaving their wonders to the open sky. Akaviri and Nordic pirates plundered much of value from the abandoned cities, predators from the inland desert prowled the empty streets, and the harsh elements took their toll as well. By the time of the Ra Gada, over a hundred years had passed since any civilization had touched southern Volenfel. The Yokudans left their continent following a cataclysm (discussed in a later section of the Guide), arriving in Tamriel in an invading fleet called the Ra Gada. The disorganized Orcs fell to them quickly, as did all the infestations of monster and beast further inland. The Redguards, as the Ra Gada came to be called, made no concession to the Breton settlements along the coasts, slashing through the southern Iliac Bay, winning the entire area that is now the Province of Hammerfell in only a few major battles. The Na-Totambu, the government of Yokuda, was transplanted whole, together with their traditional system of agriculture and religion which was well suited to the unforgiving climate of the Redguards' new home. The high domes, the flying dew sails, and the mosaic colophons were constructed over the old and new ruins of past civilizations. The Redguards' slaughter of men along the coast was not quickly forgiven, and their open scorn for their neighbors did nothing to ease relations between the newcomers and the Bretons. Over a century of unrelieved hostility only came to an end at the appearance of a common enemy in the form of the Orcish kingdom of Orsinium. Following the successful alliance, the cities of Hammerfell – as Volenfel had come to be called – finally began trading with High Rock and the Colovian West, joining the battles against new foes, such as the Sload of Thras, thanks to an alliance with Bendu Olo, the King of Anvil. Over time, Redguard society divided into two groups, depending on their allegiance to the old Yokudan ways or the new ways of Tamriel. The Crowns, who followed the traditions of the Na-Totambu, violently resisted the efforts of the Forebears, named for the original warriors of the Ra Gada, to assimilate. 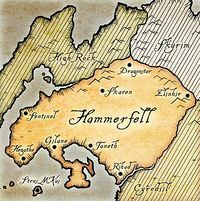 With the death of the Crown High King Thassad II in the 864th [sic] year of the Second Era, Hammerfell was taken by the Septim Empire, though some concessions were made following a successful revolt in Stros M'Kai. The division in Hammerfell society was not mended by joining the Empire, even to this day. In general, northern Hammerfell continued to be more traditionally Yokudan, in style, dress, and personality, and the southern lands, where the Forebears landed, tended to be more cosmopolitan; but, in truth, Hammerfell was and is a patchwork, with conflicting traditions nestled side by side. It is for this reason that Elinhir, a Crown city, did not answer the clarion call of Forebear cities Rihad and Taneth, in the 253rd year of the 3rd Era, allowing the Camoran Usurper to continue his northward march. In return, the Forebear cities did not assist the eastern Crown cities during the War of Bend'r-Mahk against Skyrim, preferring to watch as they were overtaken by the Nords. Following the Miracle of Peace, the Forebear kingdom of Sentinel grew to encompass the entirety of the northern coast of Hammerfell, from Abibon-Gora in the west to Satakalaam in the east, at the mouth of the Bjoulsae River. As most of the formerly independent lands in this northern area were Crown in sympathy, King Lhotun has continually been involved in military, diplomatic, and even religious missions to keep them under his wing. Lhotun has been forced to create what some consider a third party, one with reverence for the Yokudan past but respect for the Imperial ways, which is appropriately enough called the Lhotunic. Perhaps not surprisingly, the moderate Lhotunics have attracted nothing but contempt from the Crown and Forebear kingdoms alike. Clavilla, the Queen of Taneth, has tried without success to have the charters of the independent guilds revoked from all Sentinel lands, saying that the accepted worship of Satakal is grounds enough for heresy against the Empire. Ayaan-si, High Prophet of Elinhir, has called upon the True Crowns of the north to rebel against Lhotun, and financed a number of forays against the borders in Bergama and Dak'fron. His one success, thus far, has been significant. The land of Totambu, named in ancient days after the Na-Totambu of Yokuda, the progenitors of the Crowns, has returned to his fold and declared independence from Sentinel. As Lhotun's kingdom surrounds Totambu on all four sides, it is questionable how much longer it can assert itself, but at the time of this writing, its people are holding their resistance. Eastern Hammerfell, less concerned with Sentinel, has continued its efforts to take back the lands conquered by Skyrim in the War of Bend'r-Mahk. There is no question that Redguards, while currently lacking the cohesiveness as a society to form effective armies, are excellent warriors and unmatched at guerrilla warfare. Still, little ground has been regained, for the Nords too are renowned warriors.